Tim League Invites You To Join The Drafthouse Alliance | Birth.Movies.Death. 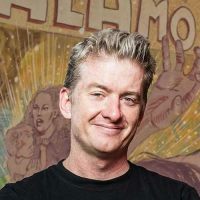 Fifteen years ago, my wife and I opened the first single-screen Alamo Drafthouse Cinema in Austin, Texas. We got into this business in the first place because we wanted to create a neighborhood theater run by movie fans for movie fans. Since then, the number of Alamo theaters has grown to eleven and we have started our own distribution label under the Drafthouse banner. Today, with both of these ventures we still try to uphold the same ideals that got us into the business. At Drafthouse Films, for example, we only acquire and distribute movies we love. I want to be able to look back in ten years and be proud of every single curated title in our catalog. Today sees the release of Drafthouse Films title The FP (#2) on DVD/Blu-ray and Digital/VOD platforms followed by Bullhead (#3) on June 26th. You could probably not find two more disparate films to announce back-to-back: one a sumptuous, powerful foreign-language Academy Award® nominee; one a bizarre comeback story set amid the world of lethal Beat-Beat Revelation video game battles. They both fit under the broad banner of Drafthouse Films in that both are fresh, bold and unique visions by exciting new filmmakers. I encourage everyone to support our efforts at Drafthouse Films by purchasing an exclusive DVD/Blu-ray fan pack for The FP, pre-ordering our upcoming Bullhead release or by joining our new “Drafthouse Alliance” membership program. Each time you buy a DVD/Blu-ray or one of our fan packs from our website, you also get a digital copy of the film as well as the soundtrack (when available). By becoming a member of the Drafthouse Alliance for $124.99, you will get either a Blu-ray or DVD (and digital download) of a current Drafthouse Films title of your choice, plus the next 9 releases shipped automatically to your door. Additionally, we will offer our Drafthouse Alliance members exclusive deals, bonus gifts and screening opportunities throughout the year. Thanks to everyone for being a part of the Drafthouse family, and I look forward to sharing more and more movies we love with you for many years to come. Drafthouse Films’ upcoming theatrical release of “the funniest film of the year,” (The Village Voice), KLOWN will hit NYC, LA & Austin theaters and VOD/Digital platforms on July 27 and the ‘80s Tae Kwon Do ninja assault cult classic MIAMI CONNECTION will debut at the New York Asian Film festival on July 7 and hit theaters later in the fall. For more Drafthouse Films updates and unique offers, subscribe to the newsletter by claiming 2 free tracks from the synth rock MIAMI CONNECTION soundtrack!